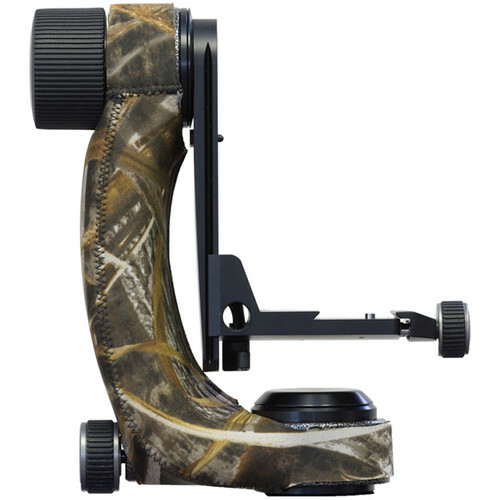 Help protect your gear with the Realtree Max5 Gitzo Gimbal Fluid Head Cover from LensCoat. The cover is constructed from waterproof neoprene that is easy to install and remove. Photographers will appreciate the thermal barrier provided by this made in the USA cover. The Realtree Max5 camouflage pattern offers maximum effectiveness in open terrain. The pattern incorporates cattails, reeds, cane and grasses to blend into flooded marshes, plus corn, wheat, oats and sunflowers to hide you in open fields. Box Dimensions (LxWxH) 10.5 x 8.5 x 0.01"
Gitzo Gimbal Fluid Head Cover (Realtree Max5) is rated 1.0 out of 5 by 1.